As visitors come to the house they never cease to comment on all the wonderful cards I have received…not even counting computer messages, texts, and emails. 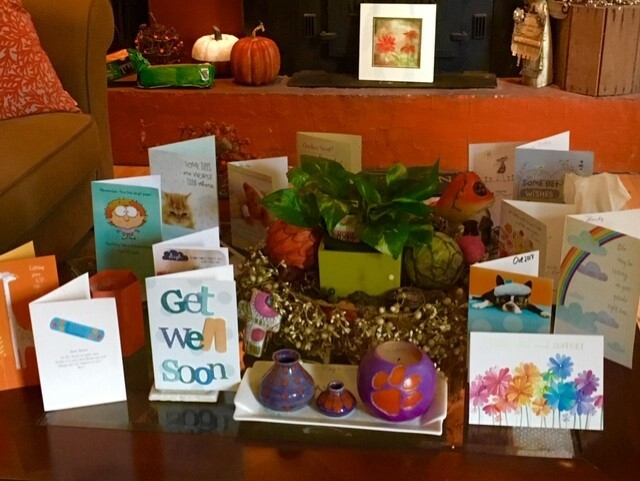 The colorful cards make me smile from my recliner…what a blessed woman I am indeed! It is something very special about opening an envelope to read what is inside and even find memorable trinkets hidden in the note cards occasionally. It is those few seconds of “mystery” that appeal to all of us before reading what the message says. My neighbor Vickie has become my mail carrier dropping off my mail right at the door…I am going to be so spoiled that when I do start walking to the mailbox again…it will feel like a forgotten art. *A soldier serving in Afghanistan is deeply touched by an anonymous Christmas card sent by a woman in California. Upon completion of his tour of duty, he returns to the United States to return the card to the widow of the soldier who originally received it but turned it over to him..since he had no family at Christmas. 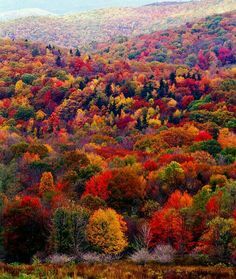 Being a Hallmark movie….you know romance and happy endings will follow…but still the theme goes back to the importance of written kindness to friends and strangers alike…who need encouragement and a sense of belonging, not only at Christmas but every day. I know it is too late to get Christmas cards overseas to soldiers spending Christmas away from home…but Operation Gratitude will still send them with notes hoping this or that soldier had a nice Christmas and thanking them for their sacrifice….the organization said that the soldiers who need them the most are new recruits, veterans, and first responders. Here I am sitting around with my leg up wondering how to pass the time and there it is….so today I will start ordering envelopes, cards, etc. to go to American soldiers abroad. And the idea came because of all of you sending me cards which mean so much to me each and every day. 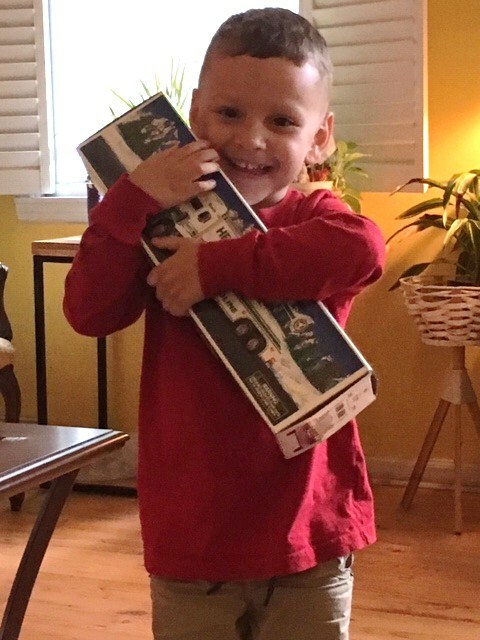 Another God Wink: Just as I was re-reading the blog yesterday morning checking for errors….a woman and little boy arrived at my house…none other than Barbara (Luke’s mom) and his adorable little nephew-Ryker. She was picking up hr grandson to take him home for the weekend with her to Landrum. I told Barbara about the power of her card to me (I had received the day before) and showed her the post. The winks just keep coming. 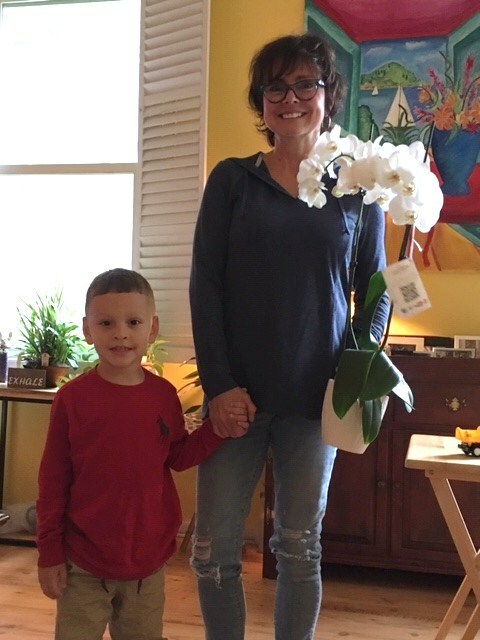 Barbara arrived with these beautiful white orchards….and Ryker left with an oldie goldie Hess truck…which thrilled him. She also went to the Electic Chef and picked us up the most delicious chicken/apple wraps which we all shared for lunch. What a marvelous day….they even brought the sunshine out for a while! Luke cleaned out my fireplace so I will be ready tonight for my first fire of the season….I am so excited! Thank you Luke! A special thanks to Sue Anne….for the best pound cake I ever put in my mouth…I forgot to take a photo before digging in….and now, after sharing slices with my wonderful neighbors, family, and friends who have helped me so much during this challenging time… there is not a crumb left for a picture…and yes the “Dingle girls” did get their slices! So until tomorrow…Taking time to write someone does take a little longer…but the power of the written word lasts so much longer to the lucky recipients. *When I first saw this photo I thought it must be a painting…and actually I was right…a God “painting” that no mortal can duplicate. As an artist who crafts handmade greeting cards you know I am loving this plug to SEND cards. Everyone who see your Big Red card is flabbergasted with all the detail in it…a keepsake! Thank you. I do have fun and now with Christmas card orders on the desk I am busy,busy.